March 9, 2018 - New Yorker Electronics has released the new VPG Foil Resistors Model 303337 ultra-high precision military- and space-grade resistor. As one of the industry’s most precise and stable precision resistors, the Model 303337 offers high-performance current sensing within mission-critical applications. The Model 303337 surface mount resistor is suited for demanding military, aerospace, defense and space applications, such as when a precision resistor is required to quickly reach thermal equilibrium in circuits either requiring fast response times or experiencing rapid current changes. Within the military, aerospace, defense and space industries, typical applications include commercial and military avionics, switching linear power supplies, power amplifiers, power management systems, feedback circuits, measurement instrumentation and associated automatic test equipment. Other applications include precision high current-sensing and precision electronic scales. 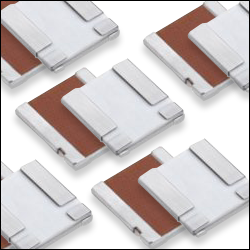 They provide enhanced characteristic capabilities resulting in superior performance when compared with other resistor technologies. Other applications include switching and linear power supplies, precision high current-sensing, power management systems, feedback circuits, power amplifiers, and precision electronic scales. It provides enhanced characteristic capabilities resulting in superior performance when compared with other resistor technologies. The Model 303337 produces a highly precise voltage that is directly proportional to measured current levels, with significantly reduced component sensitivity to applied power changes, including PCR and thermal resistance values. The industry-exclusive design of the Model 303337 incorporates VPG’s own proprietary Bulk Metal® Z Foil resistive technology, along with a four-terminal Kelvin connection, for ultra-high precision current sensing and temperature stability to 3W. New Yorker Electronics is a franchise distributor for Vishay Precision Group and offers its full line of foil technology products including Foil Strain Gages, Bulk Metal® Foil Resistors, Strain Gage Instrumentation, Current Sensing Resistors and PhotoStress stress detection. New Yorker also carries its full line of weight and control systems such as Process Weighing Systems, Steel Production Systems, Web and Strip Tension Transducers, Onboard Weighing and Overload Monitoring, Force Sensors, Load Cells, Weigh Modules and more.